European Communications devotees in front of the Basilica in Padua, Italy. From May 26 to May 28, ISKCON Communications European (ICE) leaders and representatives from 17 Countries gathered in Prabhupada Desh just outside of Venice, Italy, to discuss and share their thoughts on some pressing issues such as women’s position in ISKCON, veganism, the changing world around us with social media and how to grab people’s attention on Facebook and Instagram. The Countries represented were:UK, Belgium, Holland, France, Spain, Portugal, Italy, Slovenia, Germany, Sweden, Hungary, Czech, Slovakia, Croatia, Bulgaria, Russia and USA. 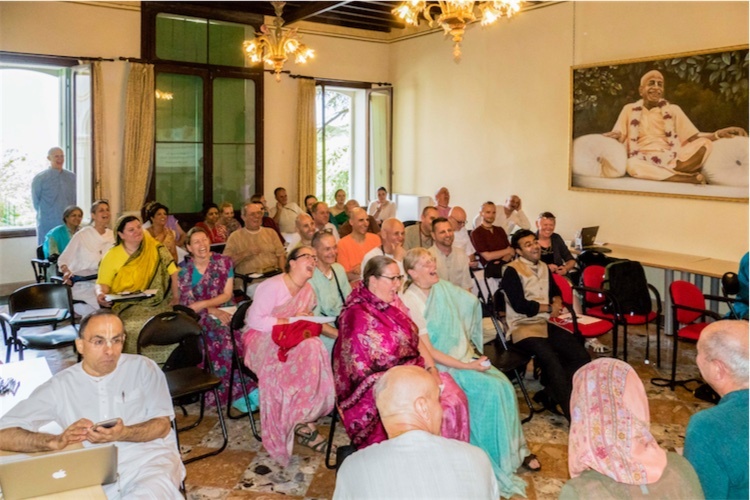 Mahaprabhu Das from Radhadesh in Belgium, a dedicated leader who has been heading the Communications efforts in Europe for over 10 years, was very excited to see the largest ever gathering of almost 50 people at this year’s meetings. He felt a certain energy and momentum this year and feels that this may have been the tipping point in the right direction. He understands there is a lot of work to be done and we have a long ways to go. He hopes that more people from more countries will attend next year and in the coming years. “There are still a lot of people who don’t know who we are and the values we stand for, they only have a partial understanding of ISKCON. If we really want to become an influential organization in the world we have a lot of work to do, to properly present our views and our position,” said Mahaprabhu. One of the fun sessions. Olessia from Moscow stated “I always come here to meet like minded devotees and recharge my batteries to become enthusiastic again.” Govindananda Das from Croatia, shared a similar sentiment where “the commitment of devotees in this communications service and readiness of devotees to think for the benefit of our society creates a family atmosphere.” Saraswati Dasi from the Netherlands also appreciated the good spirit of the event and the great discussions on women’s issues. The invigorating spirit of the conference’s discussion was also felt by Janmastami Das from Belgium, who thought that the World Cafe and Theatrics presentation by Gauri Das magnificently broke the ice and all attendees got to know each other better. Devotees visited a local synagogue. Lastly, Patita Pavana Das from Spain says he’s taking with him the inspiration and new ideas from the many like-minded devotees, and he’s also excited that he won the votes to host the next ICE meetings for May 2019. 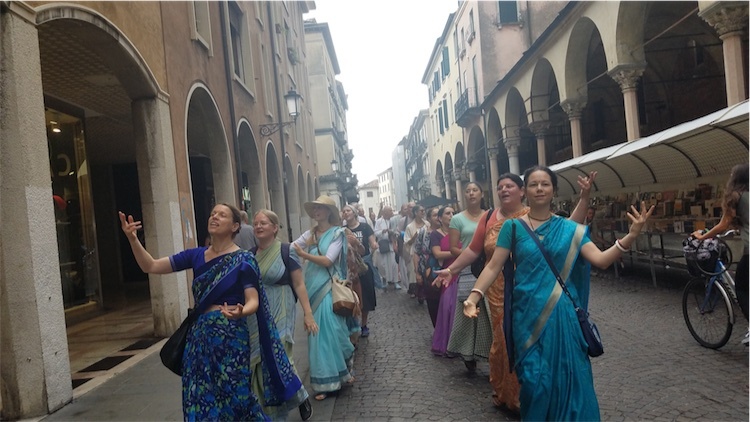 Conference attendees on Harinam on the streets of Padua. 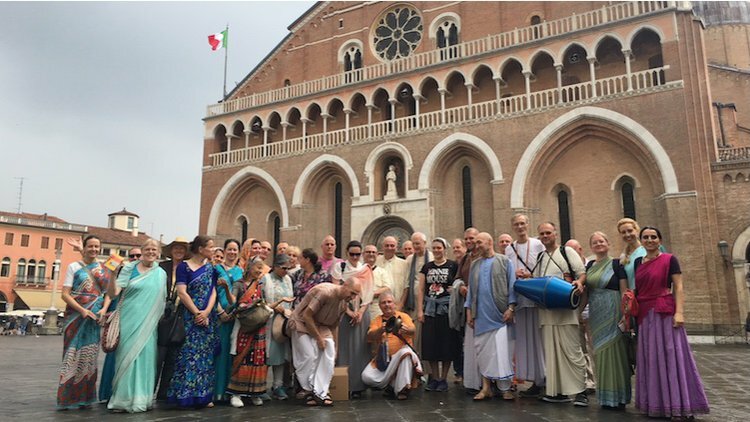 The last day the conference attendees had a fun outing to Padova, a city known for its Scrovengi Chapel from 1300s and the vast 13th Century Basilica of Saint Anthony. The Basilica, with its Byzantine-style domes and notable artworks, contains the namesake Saint’s tomb. An ecstatic Harinaam through the old town of Padova, known for its arcaded streets and stylish cafes, followed by a sumptuous lunch picnic at a famous park. 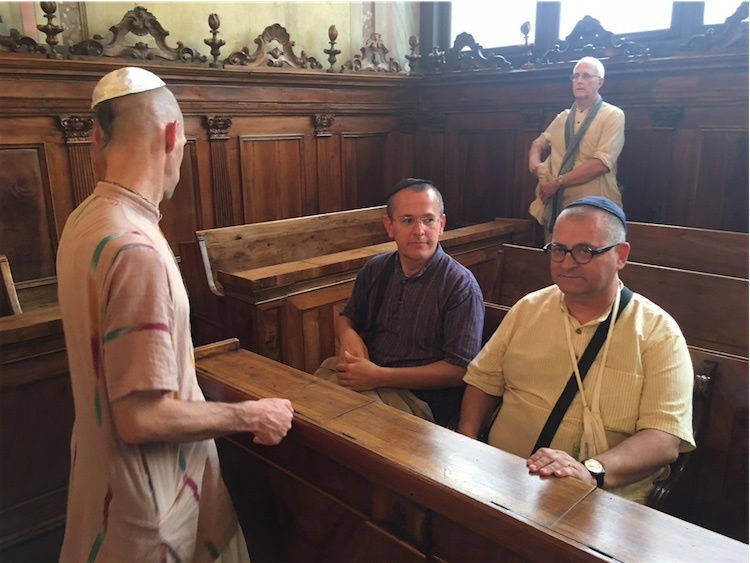 Then a visit to the only Synagogue in Padova still in use. The city is also known for its first University in Italy, The University of Padua, established in 1222. 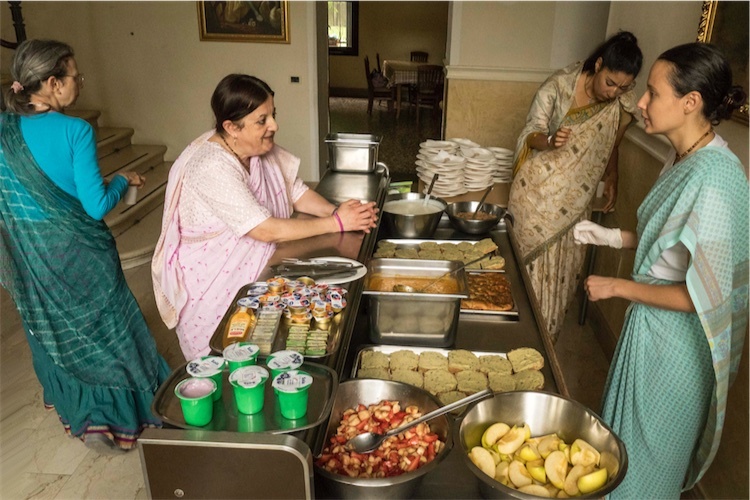 All in all, the conference attendees agreed, it was a lot of learning and fun with kirtans, warm company and out of this world prasadam pizzas, lasagna and fresh baked breads everyday.